Grenada’s first participation as an official national pavilion in 2015 at the 56th Venice Biennale was historic, putting the country on the international contemporary art map. The island was one of the smallest countries to participate in this world-renowned event, resulting in much attention being received for Grenada’s art. Many linkages formed and gave Grenada, even more, exposure in the ensuing period. The first time was historic, this second participation is truly ground-breaking. It is the first time that a country from the Caribbean, aside from the art giant of Cuba, has shown in back to back biennales. Jamaica participated once, and the Bahamas once, but up to now Grenada is the only island from the Southern Caribbean to participate. It says a lot about the determination of the artists and the commitment of the Ministry of Culture to once again take on this task of showing Grenada’s art on the world stage. The exhibition will open on 12 May, at its Official National Pavilion on 417 Fondemente Zattere and extend through the end of November. The Hon. Sen. Brenda Hood as the Minister of Culture appointed Dr Susan Mains as Commissioner and Mr Omar Donia of Contemporary Practices as the Curator. Mr Donia has great depth of experience as a curator and brings professionalism and polish. An open call to artists culminated in a contemporary art exhibition in November, from which Mr Donia chose the artists to present work in the pavilion. The theme of that call was “The Bridge,” and it will carry through to the Grenada Pavilion in Venice. 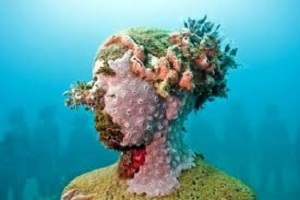 The headliner artist will be Jason deCaires Taylor, world known for his underwater sculpture parks. His first venture into putting human sculptures below the water was in Grenada, and from there it has grown to Mexico, Bahamas, and Lanzarote, Spain. Asher Mains will exhibit a new iteration of his Sea Lungs series, which was first seen outside of Grenada at the Trio Bienal in Rio de Janeiro, Brazil. A larger, more involved installation will portray the life and death of the reef, and the human relationship with the sea. Milton Williams’ art practice centres around the act of collecting. His work requires extensive travel, during which he collects objects of everyday life from the countries he visits. The work being shown in the Grenada pavilion will be an installation of some of these objects. International artists will also join the Grenada pavilion, emphasising the nature of the theme, that art is a bridge that connects and unifies people. The international artists are Alexandre Murucci (Brazil), Khaled Hafez (France), Rashid Al Kahlifa (Bahrain) & Mahmoud Obaidi (Canada). They each bring a wealth of exhibitions experiences to share. A team of volunteers from all over the world will bring this island pavilion to life. An advisory board will guide; again an international selection. Amel Mekkawi will be the Head. Others include Natalia Andakulova founder of Andakulova Gallery — Dubai, a prominent art collector from Spain, Mrs Monica Mascaros, and Sandra Louison a freelance Arts Consultant, herself of Grenadian heritage, has advised and worked with artists of multi-disciplinary genres, and also has a specific interest in creating international artist networks using social media as a resource tool. Sandra is also currently working at Whitechapel Gallery in London. The local organising committee will work under the auspices of the Grenada Arts Council.